World's first successful treatment for the core symptoms of autism. Set children free from the trap! ASD is a neuro-developmental condition usually manifested before the age of 3 years. It is four times more common in boys than girls. 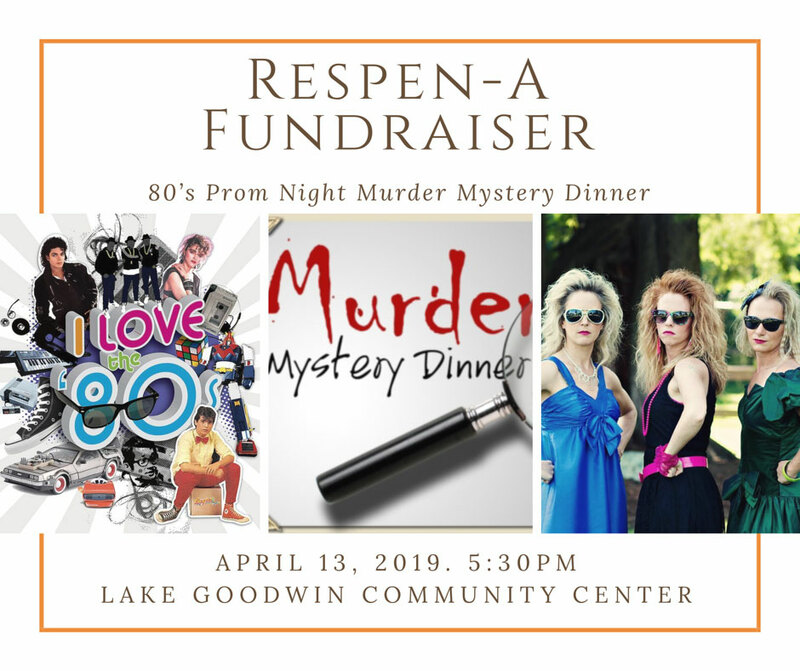 We want your help to raise the funds to have Respen-A™ manufactured and marketed as an over the counter treatment that is easily accessible to millions of children and families worldwide who are suffering the effects of autism! Autism Spectrum Disorder (ASD) has reached epidemic proportions, increasing 647% in the last 20 years! More children are diagnosed each year with ASD (1 in 45 children in the United States as of 2014) than with cancer, diabetes and AIDS combined! These are our children- these children are our future! Respen-A™, available since 2009 from only 3 compounding pharmacies, requires a doctor's prescription- this increases the overall cost to families. Of the 900+ families who have used it for their autistic children, most have only heard about it by word of mouth- there haven't been funds for costly advertising. Thousands of hours of research have gone into the making of this product. Learned doctors and researchers, labs etc., have collaborated in producing this homeopathic treatment that is making a tangible difference in the lives of those suffering with ASD! For such a time as this, when we can bring hope to many by making Respen-A™ available OTC, your support is greatly appreciated! Together, we can change the face of autism! Simply apply the topical disc to the skin in the morning and remove at bedtime. Respen-A™ requires calcium supplementation, and included with the disc is an easy to use calcium/magnesium skin cream. Parents have reported noticeable improvements in core symptoms, some within ten minutes of applying the Respen-A™ disc on their child. More than 130 doctors have prescribed Respen-A™ to more than 900 patients with Autism Spectrum Disorder (ASD). A recent study conducted by Dr. Anju Usman, MD, FAAFP, ABIHM, FMAPS, revealed a homeopathic treatment called Respen-A™ to have a significant effect in improving the core symptoms in autistic patients. Dr. Usman, who specializes in Autism Spectrum Disorders (ASD), conducted a study of Respen-A™ in nine of her patients diagnosed with ASD. Dr. Usman utilized the Autism Treatment Evaluation Checklist (ATEC) , a validated tool developed by the Autism Research Institute to evaluate the effectiveness of a treatment to improve the core symptoms of ASD. 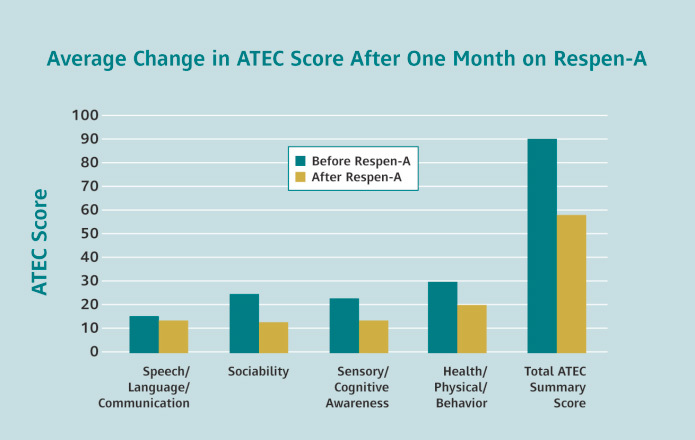 Researchers have used the ATEC to document improvement following intervention by comparing the baseline ATEC scores with the post-treatment ATEC scores. Lower scores indicate less severity of the symptoms. Eight of the nine patients showed significant improvements in Speech/Language/Communication, Sociability, Sensory/Cognitive Awareness and Health/Physical/Behavior while wearing the Respen-A™ topical disc. Despite the very small number of patients analyzed in the study, Respen-A™ showed a remarkably high effect with a p value of 0.001, meaning there was only a 1 in 1,000 possibility that the improvements seen with the Respen-A™ disc were simply by chance alone. A p value of 0.05 or less is considered significant, meaning there is only a 5 in 100 probability that the results were in error. Dr. Usman stated, “These results were unexpected because of the small study size, the older age of the patients and the chronic nature of their issues that improved in just 3 months.” The statistician for the study concluded that Respen-A™ showed a statistically significant improvement in the core symptoms of autism, having a p value of 0.001, which in layman terms means that the likelihood of a false positive was 1 in 1,000. Patients averaged 30 points of improvement in their symptoms of autism after one month of using Respen-A™. Many patients’ symptoms have resolved and are no longer considered on the Autism Spectrum after using the biomedical treatment, Respen-A™, less than one year. Respen-A™ is a homeopathic dilution of reserpine, which is an old blood pressure medication. Reserpine has been shown to double the activity of the mitochondria enzyme, monoamine oxidase-A (MAO-A). Decreased MAO-A activity has been correlated with ASD. Because reserpine is recognized as a homeopathic agent in the Homeopathic Pharmacopoeia of the United States (HPUS), Respen-A™ does not need to go through the typical FDA approval process for a drug. Respen-A™ was developed by Elaine DeLack, RN, CEO and founder of MedDEV Inc. Elaine became involved in medical research out of a need to help herself after she was diagnosed with multiple sclerosis (MS), and the therapies medicine had to offer weren’t helping her. After developing a successful treatment for Multiple Sclerosis that garnered national media attention, Elaine received a phone call from a mother who had seen her research in MS, and hoped she could help her son who suffered with severe autism [the child in the video below]. She told Elaine that she hadn't been able to hug her son for 7 years (when he was 3 years old) as he was so sensitive to touch that he couldn't even wear clothing. This compelled Elaine to begin years of biomedical research which resulted in a hypothesis that addresses the cause of autism and the rise in incidence of diagnosis, as well as a successful treatment to help free children from the trap of ASD. Elaine will never forget the day the mother called her back, in tears, because her son, after just 4 days on Respen-A™, had reached up and hugged her. "I can't describe the joy I feel when I receive that kind of phone call- it makes everything worthwhile", says Elaine. Notice how Respen-A™ helped his symptoms after just 3 days of use! 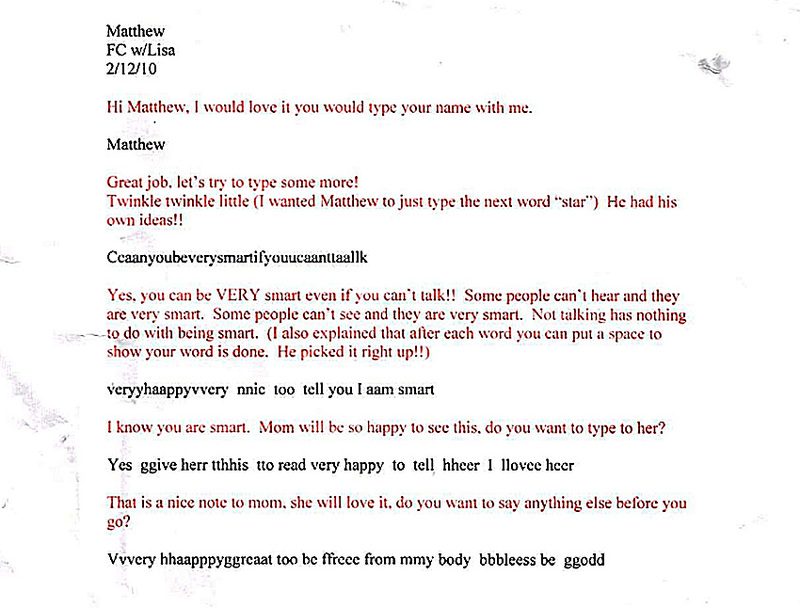 Please read the following transcript from 7 year old Matthew, who had never spoken or written a word prior to using Respen-A™. Every week his teacher, Lisa, would try to get him to communicate using a computer, but she'd never had any response. It was questionable if Matthew even understood language. After 3 weeks on Respen-A™, he typed his first communication ever! You Can Help Us Change the Face of Autism and Free Children and Adults From the Trap! With your support we can reach more children like Matthew, and set them free from the trap of autism. Please help us by pledging to support our endeavor, and please share the link to this grassroots campaign with your family and friends to help spread the word and bring hope to all families affected by autism! Due to the high costs of engineering and building the manufacturing equipment to make Respen-A™, we have divided the process into three milestones. Following this campaign we will move the project forward immediately, working on the Phase I milestone while we continue to raise funding for Phase II and Phase III milestones. Any funds received over and above our Phase I goal of $609,726 will be applied to the Phase II milestone. Please right click here for detailed information on Phase II and Phase III milestones. Base documentation required to develop processes, and validate chemical compounds with an emphasis on engineering and regulatory procedures. Validate that the assembly meets specifications. During process development, a microbial study will be required to determine the microbes present, and the quantity of each specific microbe. The remainder of these funds will be allocated to engineering the process, and associated regulatory costs. The packaging will need to be designed not only for marketability, but also to protect the active ingredients within the package. Each language on the label will require separate legal fees. It is anticipated that item 11 will be the cost of the legal fees required for an English label only. Each additional language will require a separate set of Label Specifications and Legal Fees (not in this proposal).